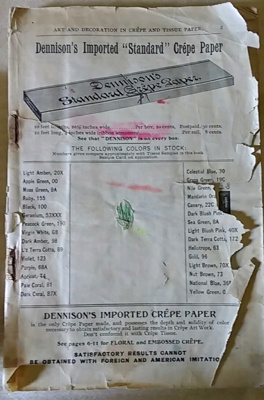 A booklet for buying crepe and tissue paper from the Dennison's Imported Crepe Paper company. Contains designs, types of papers and their prices, and other advertisements for the company. Inside first few pages is a colourful selection of sample squares of tissue paper. The booklet is inscribed by hand as belonging to: Miss I. Burnes, 806 Esquimalt Road. Irene later married Bertie Roe and became one of the owners of Roesland Resort. Paper and metal staples. Tissue paper samples.